Seminoma is the most common pure germ cell tumor (GCT) of the testis, accounting for up to 50% of cases. Among mixed GCTs, seminoma is also commonly present, in which the combination of teratoma, seminoma, yolk sac tumor, and embryonal carcinoma represent about one third of mixed cases. Overall, 60% of germ cell neoplasms have seminoma either as pure tumor or a component of a mixed tumor. Genetic changes have also been studied in the past few decades, with documentation of aneuploid DNA content in seminomas and intratubular germ cell neoplasia of the unclassified type (IGCNU), the precursor lesion. A consistent chromosomal change is present in about 80% of seminomas, which consists of a gain in isochromosome 12p [i(12p)] (see Molecular/Genetics, below). The mean age at presentation of patients with seminoma is 40 years, which is 5-10 years older than in patients with nonseminomatous testicular tumors. Up to 90% of affected patients present with symptoms and swelling, or other palpable abnormalities are the most common. Pain, however, is an uncommon symptom. The testis is usually enlarged, and the tumor nodule may distort the external appearance of the organ (see the image below). The cut surface is creme-colored to gray-tan to pink. The usual presentation is a lobulated, single to multinodular mass, confined to the testis but with a tendency to bulge into the surrounding parenchyma. Local invasion, if present, is most common in the mediastinum. Extensive hemorrhage or necrosis are unusual but may be present in large tumors. Tumors with predominant interstitial growth pattern or extensive fibrosis may be unapparent or have a scarring appearance. Pure seminoma. The tumor is white tan and slightly lobulated with foci of hemorrhage. It replaces most of the testicular parenchyma but is organ confined. Seminomas often have a diffuse, sheetlike pattern or confluent multinodular pattern. Less frequently, a tubular morphology can be seen (see the images below), posing a differential diagnosis with Sertoli cell tumor. Low magnification of seminoma replacing testicular parenchyma. Note the few isolated residual tubules. 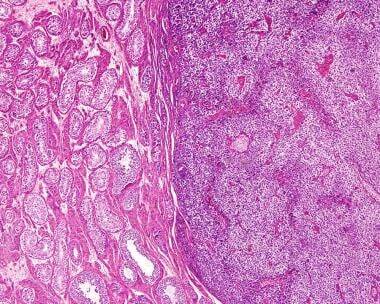 Low magnification showing sharp demarcation between seminoma and normal testis. This is distinct from case above, in which the seminoma cells permeated between seminiferous tubules. Rare histologic variants of seminomas are cribriform, alveolar, and microcystic. 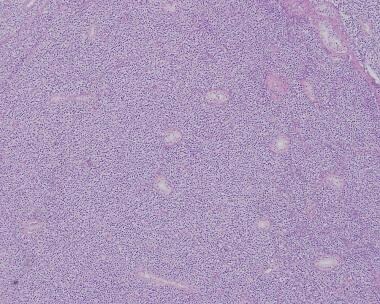 In these cases, seminoma-type nuclei are characteristic and should help with the differential diagnosis. The periphery often shows an interstitial or cordlike pattern, permeating benign seminiferous tubules (intertubular growth pattern). Edema may yield a microcystic or cribriform architecture, mimicking yolk sac tumor. Dense fibrous septae are common and areas of scarring may occur to a greater or lesser extent. Extensive fibrosis may disguise the diagnosis and complete regression is not infrequent ("burn-out"), as seen in the following image. [18, 19] Granulomatous reaction is also associated with this phenomenon and, when abundant, it can be misperceived as granulomatous orchitis. Dense hyalinized tissue is occasionally the only finding in a "burn out" tumor either in the primary testicular site or in the metastatic site, usually the retroperitoneum. Rarely, once can see "ghosts" of malignant germ cells (not shown). 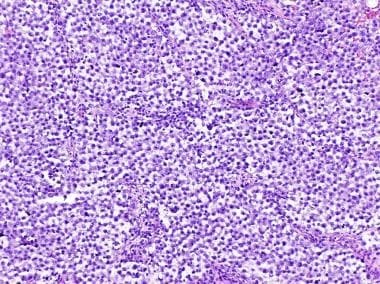 Seminoma cells have clear to eosinophilic cytoplasm with well defined borders, central nuclei, and 1 or 2 large nucleoli (see the image below). Abundant cytoplasm cause the nuclei to be well spaced although closely apposed. Variations in cytology may output a plasmacytoid appearance. Seminomas contain glycogen and are therefore positive for periodic acid-Schiff (PAS) staining, as opposed to spermatocytic seminoma. At this power, the nuclear details of seminoma cells can be appreciated. Note the similar cell size; the nuclear anaplasia, which is less than that of embryonal carcinoma; the centrally placed nucleoli; and the pink, moderately abundant cytoplasm. 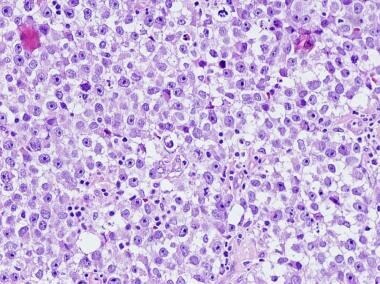 Sprinkling lymphocytes are virtually always associated with seminoma and represent a helpful diagnostic feature (see the following image). These are more prominent in and around fibrous trabeculae but are also admixed with seminoma cells. Germinal center formation has a cytotoxic effect, hence, they are usually composed of CD3+ T-cells. Larger scattered syncytiotrophoblastic giant cells are seen in up to 20% of seminomas. Solid growth pattern of seminoma cells with lymphocytic infiltrates. CD117 (KIT) stain showing strong membranous positivity in seminoma cells. 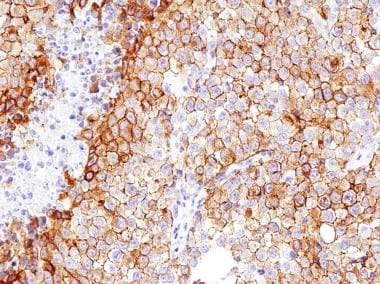 OCT3/4 immunohistochemical study at high magnification showing strong nuclear reactivity. 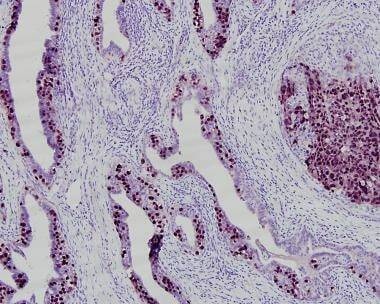 Immunohistochemical stain for OCT3/4 showing seminoma cells with pagetoid spread to the rete testis. 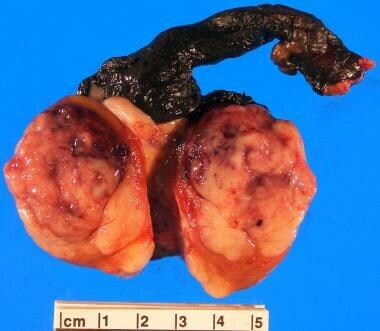 This tumor was a large seminoma (not shown) with extensive intratubular germ cell neoplasia, unclassified. Testicular GCTs are the neoplastic counterpart of primordial germ cells/gonocytes. Primordial germ cells (PGCs) are derived from the epiblast and migrate to the genital ridge as early as the 6th week of the embryonic development. PGCs are positive for OCT-4, which is thought to regulate pluripotency. Once in the genital ridge, PGCs are called gonocytes and will differentiate into oocytes (ovary) or prespermatogonia (testis). This migration is accompanied by proliferation and is controlled by the KIT stem-cell signaling pathway. All GCTs are aneuploid most likely because of early establishment of polyploidy. Polyploidy causes genomic instability with consequent genetic heterogeneity. This will lead to the phenotypic changes that drive selective survival of the best adapted clone, along with the morphologic variability of such tumors, as previously discussed. The most important prognostic factor in seminomas is pathologic TNM (pTNM) stage. Volume of primary tumor and rete testis invasion are believed to be of prognostic relevance as well. Modern therapy is eminently stage-dependent and has rendered testicular seminomas highly curable, with overall survival rates exceeding 95%. [35, 36] Seminomas metastasize most commonly to retroperitoneal nodes and then to lungs. Bone metastases, although infrequent, are more common in seminomas than in nonseminomatous tumors. A subset of more aggressive-looking tumors, the so-called "anaplastic seminomas," are a group of neoplasms that demonstrate increased nuclear pleomorphism, prominent nucleoli, and 3 or more mitoses per high-power field (HPF) (also called "seminoma with high mitotic rate"). These terms are derived from early studies performed at the Walter Reed Medical Center in Washington, DC. In 2002, Tickoo et al described a subset of seminomas with atypical features that tended to present at a higher tumor stage and were less responsive to therapy. It is not clear, however, that aggressive treatment is indicated, and it is still a matter of debate if "anaplastic seminomas" are more aggressive stage-wise when compared with the classical counterpart. Vascular invasion is a predictor of recurrence in nonseminomatous primary neoplasia, but its true significance is not well established in seminomas. 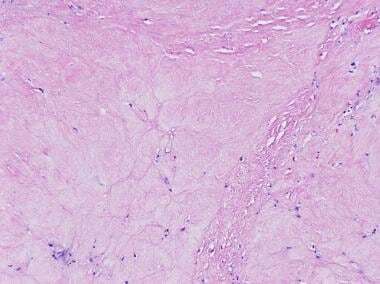 Vascular invasion demands cautious evaluation; once seminoma cells are easily detached during tissue processing, they tend to get artifactually placed in vascular spaces ("knife artifact"). True vascular invasion should display seminoma cells admixed with blood cells and/or adherent to the vessel wall. In selected cases, immunohistochemistry for endothelial cells (CD31, CD34) may be helpful. Droz JP. [Classification of germ cell tumors of the testis] [French]. Rev Prat. 2007 Feb 28. 57(4):375-8. [Medline]. Wasserman DH. Seminoma in male aged seventy-three. Urology. 1976 Dec. 8(6):579. [Medline]. Perry C, Servadio C. Seminoma in childhood. J Urol. 1980 Dec. 124(6):932-3. [Medline]. Verhoeven R, Houterman S, Kiemeney B, Koldewijn E, Coebergh JW. Testicular cancer: marked birth cohort effects on incidence and a decline in mortality in southern Netherlands since 1970. Int J Cancer. 2008 Feb 1. 122(3):639-42. [Medline]. Daniels JL Jr, Stutzman RE, McLeod DG. A comparison of testicular tumors in black and white patients. J Urol. 1981 Mar. 125(3):341-2. [Medline]. Akre O, Ekbom A, Hsieh CC, Trichopoulos D, Adami HO. Testicular nonseminoma and seminoma in relation to perinatal characteristics. J Natl Cancer Inst. 1996 Jul 3. 88(13):883-9. [Medline]. United Kingdom Testicular Cancer Study Group. Aetiology of testicular cancer: association with congenital abnormalities, age at puberty, infertility, and exercise. BMJ. 1994 May 28. 308(6941):1393-9. [Medline]. [Full Text]. Akre O, Pettersson A, Richiardi L. Risk of contralateral testicular cancer among men with unilaterally undescended testis: a meta analysis. Int J Cancer. 2009 Feb 1. 124(3):687-9. [Medline]. Dusek L, Abrahamova J, Lakomy R, et al. Multivariate analysis of risk factors for testicular cancer: a hospital-based case-control study in the Czech Republic. Neoplasma. 2008. 55(4):356-68. [Medline]. Hardell L, Ohlson CG, Fredrikson M. Occupational exposure to polyvinyl chloride as a risk factor for testicular cancer evaluated in a case-control study. Int J Cancer. 1997 Dec 10. 73(6):828-30. [Medline]. Daling JR, Doody DR, Sun X, et al. Association of marijuana use and the incidence of testicular germ cell tumors. Cancer. 2009 Mar 15. 115(6):1215-23. [Medline]. [Full Text]. Cook MB, Graubard BI, Rubertone MV, Erickson RL, McGlynn KA. Perinatal factors and the risk of testicular germ cell tumors. Int J Cancer. 2008 Jun 1. 122(11):2600-6. [Medline]. Miyai K, Yamamoto S, Iwaya K, et al. Allelotyping analysis suggesting a consecutive progression from intratubular germ cell neoplasia to seminoma and then to embryonal carcinoma of the adult testis. Hum Pathol. 2013 Oct. 44(10):2312-22. [Medline]. Oosterhuis JW, Castedo SM, de Jong B, et al. Ploidy of primary germ cell tumors of the testis. Pathogenetic and clinical relevance. Lab Invest. 1989 Jan. 60(1):14-21. [Medline]. Bokemeyer C, Nichols CR, Droz JP, et al. Extragonadal germ cell tumors of the mediastinum and retroperitoneum: results from an international analysis. J Clin Oncol. 2002 Apr 1. 20(7):1864-73. [Medline]. Hartmann JT, Nichols CR, Droz JP, et al. Prognostic variables for response and outcome in patients with extragonadal germ-cell tumors. Ann Oncol. 2002 Jul. 13(7):1017-28. [Medline]. Jacobsen GK. Alpha-fetoprotein (AFP) and human chorionic gonadotropin (HCG) in testicular germ cell tumours. A comparison of histologic and serologic occurrence of tumour markers. Acta Pathol Microbiol Immunol Scand A. 1983 May. 91(3):183-90. [Medline]. Balzer BL, Ulbright TM. Spontaneous regression of testicular germ cell tumors: an analysis of 42 cases. Am J Surg Pathol. 2006 Jul. 30(7):858-65. [Medline]. Mola Arizo MJ, Gonzalvo Perez V, et al. [Burn out bilateral testicular tumor] [Spanish]. Actas Urol Esp. 2005 Mar. 29(3):318-21. [Medline]. Yakirevich E, Lefel O, Sova Y, et al. Activated status of tumour-infiltrating lymphocytes and apoptosis in testicular seminoma. J Pathol. 2002 Jan. 196(1):67-75. [Medline]. 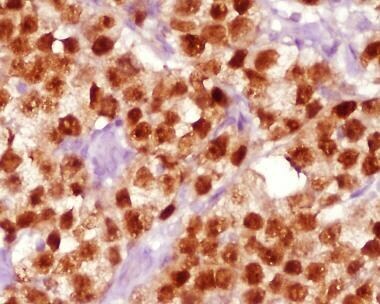 Koshida K, Wahren B. Placental-like alkaline phosphatase in seminoma. Urol Res. 1990. 18(2):87-92. [Medline]. Liu DL, Lu YP, Shi HY, et al. [Expression of CD117 in human testicular germ cell tumors and its diagnostic value for seminoma and nonseminoma] [Chinese]. Zhonghua Nan Ke Xue. 2008 Jan. 14(1):38-41. [Medline]. Jones TD, Ulbright TM, Eble JN, Cheng L. OCT4: A sensitive and specific biomarker for intratubular germ cell neoplasia of the testis. Clin Cancer Res. 2004 Dec 15. 10(24):8544-7. [Medline]. Koshida K, Uchibayashi T, Hisazumi H. Characterization of seminoma-derived placental-like alkaline phosphatase. Urol Int. 1991. 47 suppl 1:96-9. [Medline]. Jones TD, Ulbright TM, Eble JN, Baldridge LA, Cheng L. OCT4 staining in testicular tumors: a sensitive and specific marker for seminoma and embryonal carcinoma. Am J Surg Pathol. 2004 Jul. 28(7):935-40. [Medline]. Lau SK, Weiss LM, Chu PG. D2-40 immunohistochemistry in the differential diagnosis of seminoma and embryonal carcinoma: a comparative immunohistochemical study with KIT (CD117) and CD30. Mod Pathol. 2007 Mar. 20(3):320-5. [Medline]. Bode K, Barghorn A, Fritzsche F, et al. MAGEC2 is a sensitive and novel marker for seminoma: a tissue microarray analysis of 325 testicular germ cell tumors. Mod Pathol. Jun 2011. 24(6):829-835. Cheville JC, Rao S, Iczkowski KA, Lohse CM, Pankratz VS. Cytokeratin expression in seminoma of the human testis. Am J Clin Pathol. 2000 Apr. 113(4):583-8. [Medline]. Alvarado-Cabrero I, Hernandez-Toriz N, Paner GP. Clinicopathologic analysis of choriocarcinoma as a pure or predominant component of germ cell tumor of the testis. Am J Surg Pathol. 2014 Jan. 38(1):111-8. [Medline]. Biermann K, Goke F, Nettersheim D, et al. c-KIT is frequently mutated in bilateral germ cell tumours and down-regulated during progression from intratubular germ cell neoplasia to seminoma. J Pathol. 2007 Nov. 213(3):311-8. [Medline]. van Echten J, Oosterhuis JW, Looijenga LH, et al. No recurrent structural abnormalities apart from i(12p) in primary germ cell tumors of the adult testis. Genes Chromosomes Cancer. 1995 Oct. 14(2):133-44. [Medline]. Netto GJ, Nakai Y, Nakayama M, et al. Global DNA hypomethylation in intratubular germ cell neoplasia and seminoma, but not in nonseminomatous male germ cell tumors. Mod Pathol. 2008 Nov. 21(11):1337-44. [Medline]. Nelson R. MiR-371 Promising New Marker in Testicular Germ Cell Tumors. Medscape Medical News. Available at http://www.medscape.com/viewarticle/840730. March 02, 2015; Accessed: December 22, 2015. National Cancer Institute. Stages of testicular cancer. Available at http://www.cancer.gov/cancertopics/pdq/treatment/testicular/Patient/page2. Accessed: June 6, 2010. Steele GS, Richie JP, Stewart AK, Menck HR. The National Cancer Data Base report on patterns of care for testicular carcinoma, 1985-1996. Cancer. 1999 Nov 15. 86(10):2171-83. [Medline]. Cost NG. Testicular germ cell tumors. Current concepts and management strategies. Minerva Urol Nefrol. 2013 Jun. 65(2):133-55. [Medline]. Maier JG, Sulak MH, Mittemeyer BT. Seminoma of the testis: analysis of treatment success and failure. Am J Roentgenol Radium Ther Nucl Med. 1968 Mar. 102(3):596-602. [Medline]. Tickoo SK, Hutchinson B, Bacik J, et al. Testicular seminoma: a clinicopathologic and immunohistochemical study of 105 cases with special reference to seminomas with atypical features. Int J Surg Pathol. 2002 Jan. 10(1):23-32. [Medline]. Perrotti M, Ankem M, Bancilla A, deCarvalho V, Amenta P, Weiss R. Prospective metastatic risk assignment in clinical stage I nonseminomatous germ cell testis cancer: a single institution pilot study. Urol Oncol. 2004 May-Jun. 22(3):174-7. [Medline]. The authors thank Dr. George Netto for the invaluable teaching on germ cell tumors.